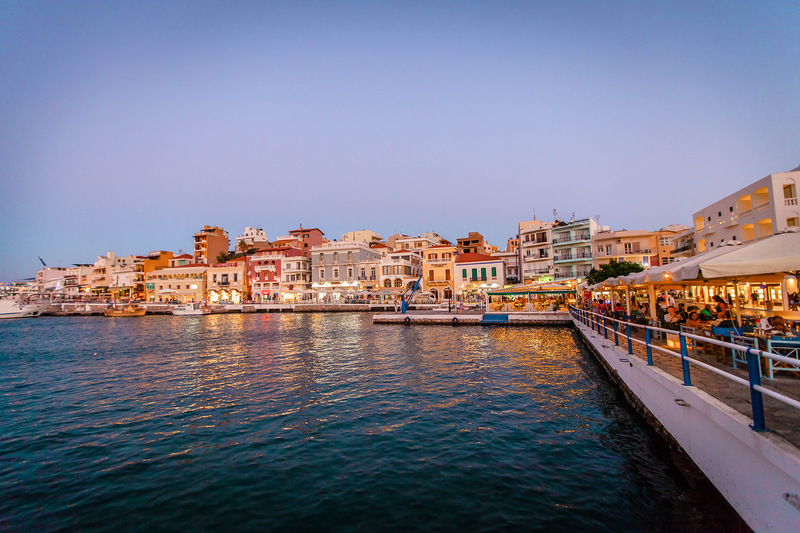 At about 40,000 Rethymno is the 3rd most populous city in Crete after Heraklion to the west and Chania to the east. Situated between those 2 bigger cities on the north coast of the island, it's about 50 km from each. It is a quieter, more provincial holiday destination than its larger neighbors and their environs, a mid-sized city full of interesting architectural features and lots of really nice beaches nearby. Rethymno was known in antiquity as Rhithymna. It was mentioned in the writings of Ptolemy, the Greko-Egyptian mathematician/astronomer/geographer who lived about AD 100-170, as well as Pliny the Elder (AD 23-AD 79), the Roman naturalist/philosopher/naval commander (note: he died in the eruption of Mt. Vesuvius). Rhithymna's history goes back to Minoan times, whose acme as a civilization was about 2000-1500 BC. The place name changed to Arsinoe (after a Ptolemaic Greek Princess of Egypt who lived around 300 BC) during the Hellenistic Period. Arsinoe was either next to ancient Rhithymna, or right on top of it. The name reverted back to Rhithymna sometime after the birth of Christ. After several centuries of Byzantine rule, the Venetians took control of Rethymno in 1204, but other than putting up a number of buildings in the present Old Town, the busy Venetians were too occupied elsewhere in the Mediterranean to provide adequate defense and the city suffered from periodic attacks during the next 3 centuries, most notably by the pirate Barbarosa (Redbeard) in 1538. This led to the construction of defensive fortifications. The city really began to flourish in the latter 16th century, when its Cretan-Venetian character was established, particularly in its architecture. The Venetians made Rethymno an intermediate commercial port between Heraklion and Chania, assigning to it its own (Catholic) bishop and a class of nobles. After it was razed in 1571 by Uli Ali, Pasha of Algiers, who attacked with 40 galleys and easily overran the town, the Venetians pretty much rebuilt the entire city. This part of Rethymno is now known as the Old Town (Palia Poli). It remains one of the best preserved Venetian old towns on the Greek islands. The Old Town has retained its Italian architectural character, featuring the massive Fortezza (the citadel and castle guarding the harbor), bougainvillea-bedecked, stone-constructed arches and gateways, doorways, and staircases, scattered Byzantine, Roman and Hellenic ruins, churches, Mosques, a compact Venetian harbor, and characteristic narrow streets. The Ottoman Turks captured Rethymno in 1646 and stayed until the 20th century, using the town as a sanjak, or administrative center. During the 1821-1829 Greek War of Independence, Rethymno (and Crete) took an active role. The uprising was suppressed by Muhammad Ali of Egypt, who sent his son, Ibrahim, to Crete, where he began massacring Cretans. As a reward, the Turks gave Crete (and Rethymno) to Egypt in 1830. But in 1840 the British forced Egypt to give Crete back to the Turks. Towards the end of May, 1941, The Battle of Rethymno was fought between Nazi paratroopers and Cretan and Australian forces. The allies held their own until the ultimately victorious Germans received reinforcements from their victory in Maleme, west of Chania. Recent years has seen considerable development in Rethymno from its tourism sector, which accounts for most of its employment and revenue. Despite this, the town and the area around it retains its unique character. This Renaissance-era district is remarkable for its well-preserved combination of Hellenic, Turkish, and (predominantly) Venetian architectural elements. The masons, carpenters, and architects who built Old Town after the Venetians came in 1204 were Italians who then trained native Cretan builders to carry on the work. The semi-circle described by the harbor, which curves northwest for about 500 meters, determined the street layout of Old Town, whose main thoroughfare, Eleftheriou Venezelou, parallels the curve along the harbor front. This is in contrast to both Chania's and Heraklion's main streets, which run inland, at a right angle, from their harbors because the layout of their defensive fortifications walled off both cities' access to the sea. 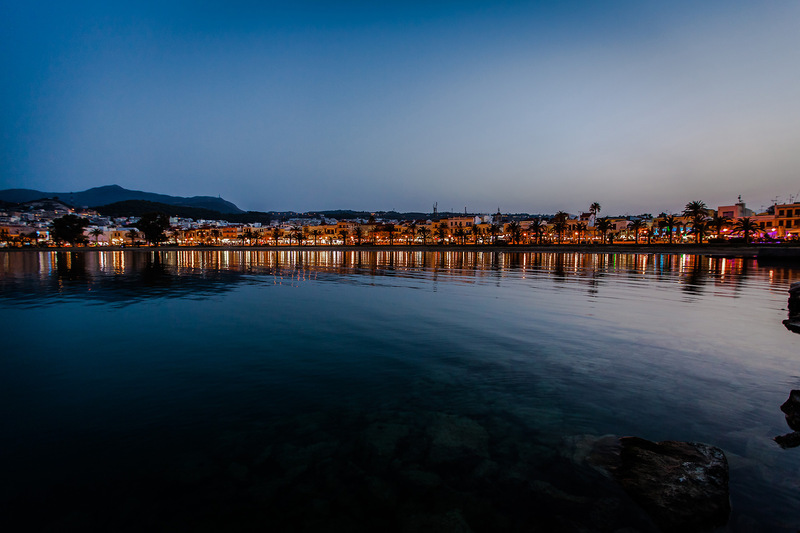 Topographically, Venetian Rethymno runs along the base of a fat peninsula about 700-by-700 meters, jutting northward into the sea, with the harbor on the peninsula 's east side. 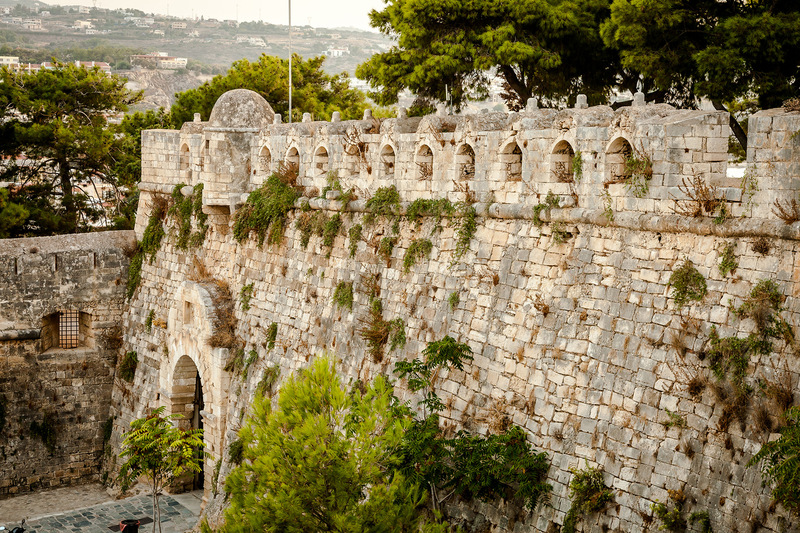 The Fortezza, the town's first and strongest line of defense, dominates the peninsula's northern end. Sited on a low hill, the Fortezza is probably built on ancient Rhithymna's acropolis, which included temples dedicated to Apollo and Artemis, and, in Roman times, Diana, who was the Roman version of Artemis. The Fortezza was built between 1573-1580. It was Venice's decision to use Rethymno as an intermediate port between Chania and Heraklion that led to the construction of the harbor, the Fortezza, and the town's other fortifications. At about 300 x 200 meters, the Fortezza is the largest and most complete citadel built by the Venetians on Crete. Its size was meant to accommodate all of the houses of the then current residents of the town, to ensure their safety, but once it was finished, the Rethymnoiots refused to move in. One theory holds that this was because they were already finished rebuilding their own houses after the city had been destroyed by Uli Pasha. But it is more likely that there simply was not enough room in the Fortezza for houses for the city's 5,200 inhabitants. After Rethymno fell to the Turks in 1646, the Cathedral of St. Nicholas in the Fortezza was converted into a mosque, whose dome still stands. The Turks built houses in the Fortezza for its administrative staff and garrison. By 1900, the Fortezza's interior was full of houses, but their residents began to move out after WWII. A number of stone buildings remain, but most of the Fortezza's interior is now empty. 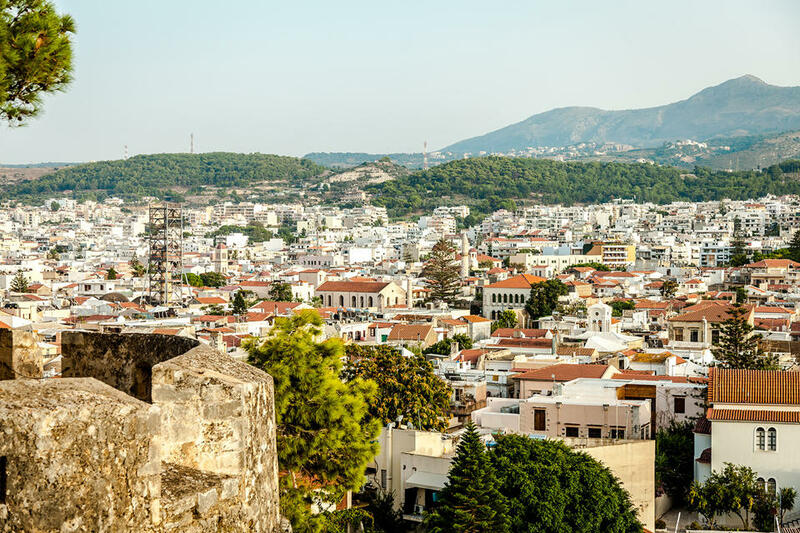 Some of the buildings still standing include the mosque, the churches of Agia Katerini and Agios Theodoros, the artillery magazine, the Rector's residence, the storeroom, and the gunpowder magazine. There are more Greek features on the Old town's buildings than in the older parts of Chania and Heraklion because the noble class, known as the "Archondoromeoi" ("archondo" = "ruler," "romeoi" = "Romans," i.e. Eastern Romans or Byzantines), was mainly Greek. The structures had a number of gothic features- decorative, pointed arches, gargoyles, light, airy spaces, soaring buildings, ornate stone carvings- many of which were destroyed by Ulu Hali in 1571. Surviving features of Ottoman architecture include the use of timber, and the sahnisia- projecting second stories of houses. For some reason the Turks often plastered over the dressed stone of Venetian buildings. Rethymno has escaped the earthquakes that have plagued the rest of Crete over recent centuries, so the older buildings are in good repair. In front of the main gate of the Fortezza is the pentagonal Rethymno Archeological Museum, featuring chronologically-ordered exhibits of the region from Neolithic to Roman times. The Venetian Harbor. This picturesque little harbor, less than 100 meters in diameter, is enclosed on its east side by the mole the Venetians built in the 13th century. Across the harbor's mouth and beyond the mole is the much larger, L-shaped boat slip and dock for the larger cruise ships and ferries coming in from Piraeus and elsewhere in the Mediterranean. At the end of the mole is the charming Egyptian lighthouse, built in 1830, after the Turks had given Crete to the Egyptians. At 9 meters, it is the second-tallest Egyptian lighthouse on Crete, after the one in Chania. The quay itself is lined with tavernas, cafes, and restaurants occupying the ground floor of two and three-story Venetian-style buildings with later, Turkish-influence structures making for a colorful, pleasing-looking whole. Docked fishing boats bob along the quay, along with some old-style wooden ships, including a fake pirate ship or two, used for local cruises. Heading inland from about the center point of the harbor is an alleyway which leads, after a few meters, to the Venetian Loggia. A loggia is a building with an arched facade, with the building proper set back. The space created between the arches and the front of the building is used as a space for people to relax in the shade and take in the street view. The Loggia at Rethymno, over 400 years old, is in almost perfect condition. A mosque during Ottoman rule, the Loggia now belongs to the Greek Ministry of Culture. From the Loggia, if you continue on Paleologo Street, you'll shortly come to Platanos (Plane Tree) Square and the Rimondi Fountain. The water flowing from the 3 lions' heads set in the dressed stone, Corinthian column-decorated facade wall of the fountain, has been a source of refreshment for thirsty passers-by since 1626. Continuing east from the fountain and the square, along narrow Arabatzolou Street, you come to Our Lady of the Angels (now Orthodox, formerly Catholic) church, built by the Dominicans in the latter years of Venetian rule. It's dedicated to Mary Magdalene. Locals call it the "Mikri Panagia ("Little Virgin")," in contrast to the "Megali Panagia ("Large Virgin")," the town's metropolitan church. This beautiful, tall and narrow, arched white building with its Italianate, cross-surmounted bell tower has been in continual operation longer than any other church in Rethymno. After the church, a left on Vernardou Street takes you in the direction of the harbor, to the 17th century building housing the Historical-Folk Museum, which has collections of fabrics, pottery baskets, coins, costumes, and the tools needed to make them. The Museum is an effort to present daily life in a villa during the latter years of Venetian rule. Just a bit further down the same street is the Nerantze Mosque. Built originally as a church, the Mosque has the tallest minaret in Rethymno. The mosque now houses the Municipal Odeon (Music School). A right turn on Ethnikis Antistaseos Street, running southeast, roughly parallel to the harbor, takes you past the Church of St. Francis, which the Ottomans used as a poorhouse. Next door is a primary school originally built in 1796, rebuilt in 1890- and still used as a school today. A bit further on takes you to the Porta Guora, Rethymno's former main gate, and the last remnant of her defensive walls. Flanked by the facades of stone and stucco houses, gate's arch still stands but the walls are gone. Slanting back towards the harbor on Gerakari Street, after a few hundred meters you come to the Kara Musa Pasha Mosque, a one-story, multi-domed stone structure. The fat gothic arches along its front date from its years as the Venetian Monastery of St. Barbara. Not far from the mosque is Platia Heron (Heroes Square) with its statue of the Unknown Soldier. If you walk just 30 meters towards the harbor from the Kara Musa Pasha Mosque, you'll come to Arkadiou Street, which, like Eleftheriou Venizelou one block harbor-ward, follows the curve of the water's edge. Along this street are, chock-a-block, many Venetian-era mansions. These dressed-stone buildings with their molded facades and neo-classical entryways will make you think that that you're in Italy, not Greece. However, the interior of these houses are usually more Cretan in character, as it was more economically feasible to use interior designs and materials readily available in Crete, such as un-milled, lacquered timber ceiling beams and fieldstone walls tuck-pointed with white cement. Some of these mansions have been converted into rental rooms for those lucky enough to reserve one. Enetiko Limani (Venetian Port) Beach is along the shoreline of the new harbor, southeast of the Venetian harbor. Starting at the Venetian harbor lighthouse and running southeast for 350 meters, this beach is often packed in the summer because of its proximity to town. Although the waters aren’t quite what they are further from town, still and all they are quite nice. The beach isn’t really organized but will do for short-term visitors. Its big advantage is that the harbor helps to block the Meltemia winds which blow out of the north in summer. Rethymno Town Beach is just east of the Enetiko Limani Beach. Because it’s close to town, it attracts a lot of visitors, but it is well-organized, with sun beds, umbrellas, and a variety of water sports. Beach bars line its length, and a flag system is in place to warn of the high winds which can endanger small children. The following beaches are really part of one long strand running eastward from Rethymno for about 20 km. At 4 km east of town, Platanias Beach is a pretty, sandy place exposed to the north and its sometimes high summer Meltemia winds. There is frequent bus service from town. Platanias Beach has everything you need: beds and umbrellas, water sports, tavernas, bars, and overnight accommodations. 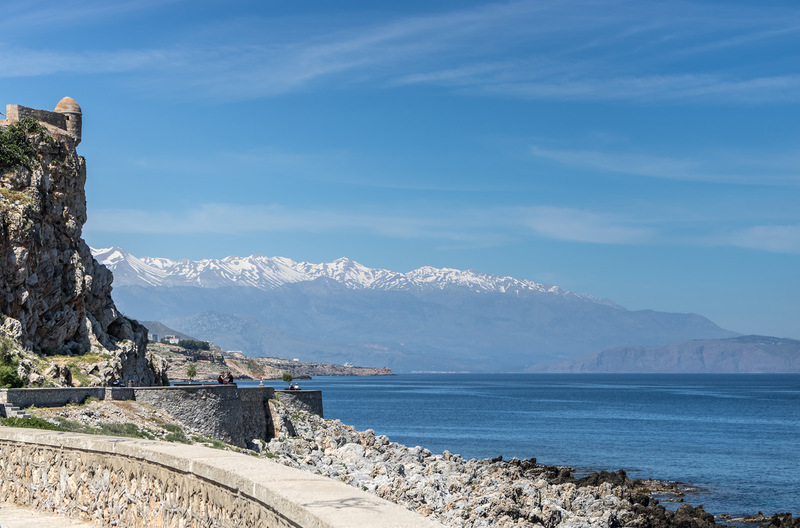 Just 1 km further east from Platanias, Missiria Beach is situated close to Crete’s National Road leading to Heraklion. This excellent beach is quietly beautiful, but can be somewhat windy. It has clean, clear waters and all the amenities, including sun beds and umbrellas. Just past Missiria Beach is Platenes, a part of Adele Beach, also known as the Adelianos Kampos. This is a 4 kilometer-long stretch of sand and pebbles is part of the continual beach running east from Rethymno. Platenes is a favorite for partygoers, with discos, dusk-to-dawn bars, and water sports. The whole area is very amenable to tourism of all stripes, including families, with a wide variety of accommodation available. Eight kilometers east of Rethymno, Pigianos Kampos Beach is a long, sandy beach with a less-developed tourist infrastructure than some other beaches. This, or course, can be a good thing for the visitor seeking a little peace and quiet. There are some hotels and tavernas there, just not as many as in other places. The winds can kick up a bit during the summer months, but this is a common problem all along Crete’s northern coast. Stavromenos Beach is 11 km east of town. Regular busses run from Rethymno to this quiet little village. After you get off the bus you have to walk a couple hundred meters down to the beach. The heights above the beach give you a nice view of the surroundings, including the sun-kissed waters of the Cretan Sea. Sun beds and umbrellas are available. The beach has a nice tavern or two serving traditional Cretan dishes. There are stores and markets in the village if you need something. What’s special about Stavromenos Beach are the night time visits of the locally-called caretta-caretta (loggerhead) turtles who come ashore to lay their eggs. This protected species frequent the beach from May to September, which is their mating and nesting season. During this time sections of the beach can be fenced off for their protection. In addition to these beaches, there are a some nice beaches further out, such as Bali, 32 km to the east, a beautifully sited coastal village with surrounding mountains, featuring little inlets and a very popular main beach. Geropotamos, 18 km east, is secluded, seldom visited, and with minimal tourist facilities. Petres is 12 km west and favored by locals. There is a nearby taverna. Because of Rethymno's center-west location on the north coast, you can take a bus to almost anywhere else on the western half of the island and be there in an hour or less. Plakias, for example, a very nice beach on the south coast, is about a half hour south. Arkadi Monastery, about a half hour's drive (23 km southeast), was the site of a Turkish siege. Founded by the Byzantines in the 5th century, the present main church was built in the Venetian style by Greeks during 16th century, in an interesting Italian Baroque architectural style. It was known as a center of learning, with a large library. In 1866 943 Greek women and children chose to blow themselves up with gunpowder barrels rather than surrender to the Turks. It is now a national sanctuary honoring the Cretan Resistance against the Ottomans. Atsipopoulo is a village, really a suburb, just 5 km south, it is an atmospheric place full of Italian-style architectural touches. The houses were built each wall touching the other in order to provide not only shelter, but a defensive perimeter around the village. many of the old villas have been renovates, and some now serve as small hotels. Rethymno Myli is 7 km from Rethymno. Its inhabitants were forced to move to a new location because of the unstable geology which led to rock slides, destroying many homes and the water mills (mylia) which provided its people with a living. Myrthios, 20 km south, is situated at an altitude of 500 meters, and is surrounded by natural gorges and rock formations. It features many picturesque stone cottages. Not far from Myrthios is Prassies, a village in a relatively lush area ("prassino" = "green) with a beautiful gorge nearby. Melidoni Cave, about 30 km east of Rethymno, and 5 km inland from the sea, is an important cave with a sad story attached to it. The cave is named after Antonios Melidonis, a leader in the rebellion against the Turks, who was from the nearby village of Melidoni. In 1824 250 villagers who were taking refuge in the cave from the Turks, were suffocated when the Turks sealed the entrance. The cave now houses a large sarcophagus containing the bones of the victims, which has become a monument to the Cretan resistance. The cave was said to be the home of Talos, a mythical bronze giant who was the first robot in history. He was a gift to King Minos from Zeus to be the guardian of Crete. A vein running from his neck to his ankles carried his blood- molten metal. Nails in his ankles kept the blood from running out. Jason and his Argonauts tricked Talos, occupying him by using the sorceress Medea to tell him tales while she cast spells, causing Talos to lose his common sense, remove the nails from his ankles, and "bleed" to death. The cave was also the site of worship of a female deity during the middle Minoan period (2100-1600 BC). A copper ax from this period has been found there. The cave seems to have always been a place of great religious importance; the Romans worshipped "Taleos Hermes" there, as well. As you can see, there are many, many places to visit and things to do in the area of Rethymno, as well as in the city itself. It makes for an unforgettable holiday.